On Thursday November 2nd the Church called to mind and to prayer the souls of the faithful departed starting a period of month long prayer for the Holy Souls. Faithful around the world gathered to pray for those who have gone before us in the hope of entering into the glory of the kingdom of heaven. 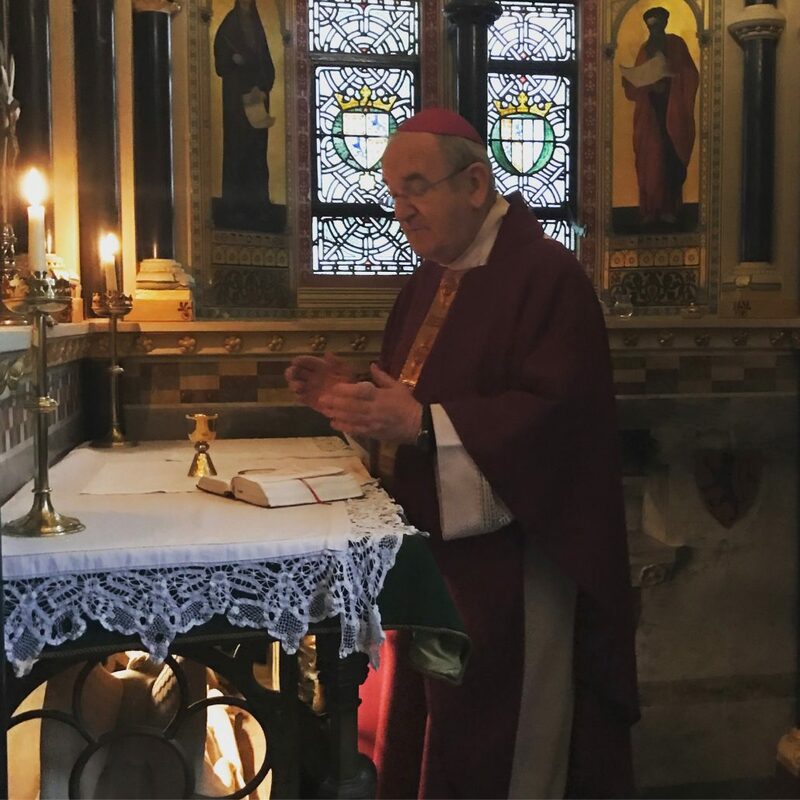 During the day Archbishop George Stack visited the chapel at Cardiff Castle of offer a requiem Mass for the deceased members of the Bute lineage. The title ‘Marquess of Bute’ is a title of peerage of Great Britain. The first Marquess of Bute was John Stuart, a politician who was granted the title in 1744. Since then the title has been handed down the line within the Stuart family and the present day Marquess John Crichton-Stuart, 7th Marquess of Bute. Notably in 1868 the 3rd Marquess of Bute, John Crichton-Stuart, converted to the Catholic Faith. Since then, the family has remained Catholic. The family as a whole brought power and prosperity to Cardiff, which they turned from a backwater into one of the greatest coal exporting ports in the world. Modern day Cardiff owes much to the lineage. In addition, Cardiff Castle and the surrounding grounds were the remit of the family. It was the 5th Marquess of Bute that gave the castle to City and people of Cardiff. Therefore it was very poignant that on the Feast of All Souls the present Archbishop of Cardiff should visit the chapel at the former family home to pray for the deceased members of the family. The Mass has become a tradition in commemoration of the once faithful stewards of the city of Cardiff.